This is going to be a quick post, so if it seems rushed, it's because it is rushed. Apologies! In random News, though this isn't that random for myself, I have created a Podcast. As in, I have an introductory Podcast right now. Following episodes should ensue. Okay, so here's the story for this; I've been pondering about whether or not I have wanted to do a podcast for near on 2 years now, probably around the time before the Digest came about, and very recently I realised my desire to do this was stronger than ever; this is because I want to do something in place of my videos, and also because I like talking. I also want this podcast to try and motivate me to bringing my Digest back, as I want to briefly touch on news and such in this in the Idol world... However, I do not want this to be completely about Idols, I want it to be diverse. So, I will be talking about other things such as film, my life in general, comments, my thoughts and such, and also this blog and Idols, of course. You never know, I may just give mini reviews in the podcasts! Who knows? 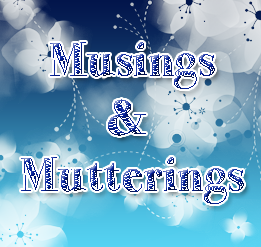 Anyway, the first episode is simply an introduction to Musings & Mutterings, which is the name of the podcast. Why Musings & Mutterings? Well, as I explain in the small introduction itself, I wanted a name different and more distinct to Okay! Musume Time, so I didn't want Okay! Musume Podcast or Okay! Podcast Time, two names which I did want to call it... no, because I want it to be about Idols and other things away from Idols, I wanted it to have a nicer name, or at least one that was different. So, I thought musings would be good, as I do that a lot, and Mutterings, because I mutter like nobody knows! So, there we have it. My title for my new podcast. Sadly the embed thing isn't working on the site for this blog, so I will instead post a link to my Podcast site, and if you do listen to my ramblings and mutterings, I hope you enjoy! Until next time (which I hope to be rather soon) I will bid you adieu and tata! AIRI~ Thank you haha <3 I've wanted to do it for so long! I hope many will come along, haha! All I could say when I saw this post title was "YESSSSSS!!! YES YES YES!" 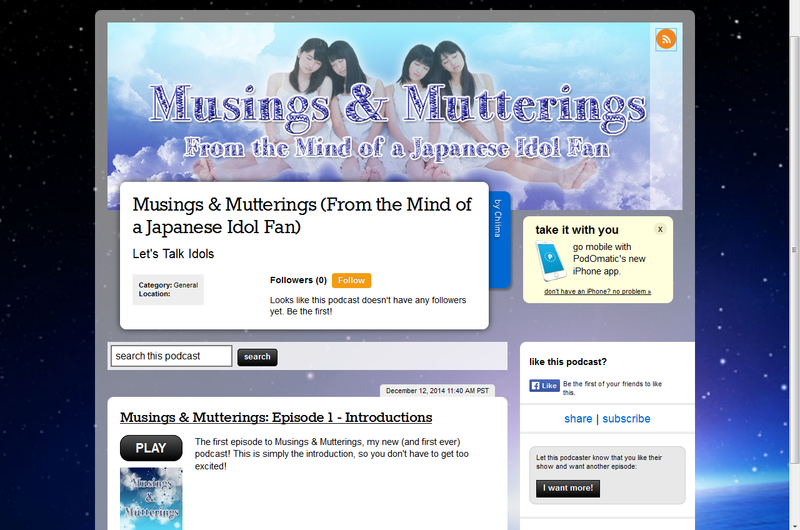 Musings and Mutterings is a good name, because it's separate from O!MT but MUSings also kinda looks like MUSume... kinda. Anyway, excuse me while I go listen to this now! Can I ask a question you might want to talk about on a future episode? It's something that's been nagging me to figure out for a while now but I guess the inquisitive part of my brain has had it on the backburner. Then I realised Chii knows way hella much about idols and all that stuff so I should ask her! ...because the audience was being off-da-hook awesome as they typically are in Japan. So good that it got me wondering (again) how the fans can be so in sync with one another with what chants they choose to fill in between the lines of the song. How do they do it, Chii? How. Do. They. Do it? My first thought was that they work it out online somewhere, like maybe someone posts a "how to" video for each song and then they learn it for the concert, or maybe they're just one big hive mind which would be alarming but way frikkin' cool, or maybe it just takes shape out of pure chaos like a flock of birds wheeling about in the sky? Anyway, I just have to know all about it now so I hope this isn't too big an ask and you have some way cool insights to share. Also, do you know what they are chanting if anything or is it just the Japanese equivalent of "Nah nah nah, woah oh, yeah yeah" type stuff? Anyway, hope that this is not all beyond your range of understanding, oh, and hey any smarty pantses reading this, please don't spoil it by answering here unless Chii says I've stumped her because podcasts need content yo and it'd be nice to hear her take on it. TIA! Anyway, good luck wit da podcast, Chii. Bestest early Chrissy pres evs!